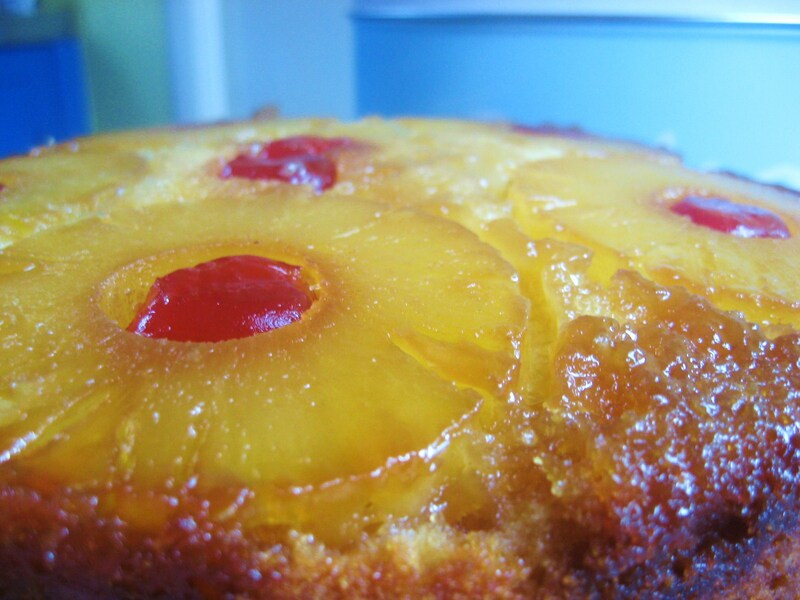 Pineapple Upside Down Cake – Mmmm. Retro. Anyway, the cake was delicious although I would recommend reducing the baking time by about five minutes because the first time I made it it was a little dry but after reducing the time for the next ones they came out perfect. 1. Preheat the oven to 180C (350F). 2. Pour the melted butter into a 20 cm (8 inch) round tin, brushing some of it up the sides but leaving most of it on the base. 3. Sprinkle the brown sugar over the base. 4. Drain the pineapple rings and save 1/2 cup of the juice. 5. Arrange the pineapple rings over the base of the tins (five on the outside and one in the centre) and put a cherry in the centre of each ring. 6. Cream the butter and sugar together until light and fluffy. Add the egg gradually, beating thoroughly after each addition. Add the vanilla essence and beat until combined. 7. Transfer to a large bowl and fold in the sifted flours, then add the coconut and pineapple juice. Stir until the mixture is just combined and smooth. The mixture will be quite thick. 8. Spoon the mixture into the tin over the pineapple rings and smooth the surface. indent the centre slightly with the back of a spoon so the cake will have a flat base to sit on. 9. Bake for 50 – 60 minutes, or until a skewer comes out clean when inserted into the centre of the cake. 10. Leave the cake in the tin for 10 minutes before turning out onto a plate or rack to cool. The recipe came from ‘The Essential Baking Cookbook‘. October 17, 2008. Tags: Baking, Cake, Pineapple Upside Down Cake. Baking, Cake, Pineapple Upside Down Cake. I made this last weekend for an 80s party – DELICIOUS!!!!! Everyone agreed if I do say so myself! April 2, 2009 at 3:53 pm. Permalink. Glad you liked it. 🙂 It’s a great recipe. April 2, 2009 at 11:44 pm. Permalink.